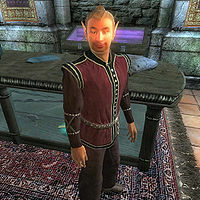 Rindir is a Bosmer trader and the proprietor of Rindir's Staffs in the Market District of the Imperial City. He sells staves and assorted clothing, including the zero-weight Mage's Hood and the unique and very powerful staff Apotheosis. While many of his merchant colleagues take the opportunity to get a breath of fresh air after closing time, Rindir likes to keep to himself and is only seen outside the shop during the weekends. He gets out of bed every day at 6am and always starts the day with a two-hour breakfast in the main trading room. At 8am, he unlocks the door and spends the next twelve hours offering his services to the occasional customer, before closing up again at 8pm. On all normal weekdays (Morndas to Fredas), he will spend the evening relaxing on the ground floor before going to bed at midnight. On Loredas and Sundas, he will, after closing up his shop as usual, leave the District, cross through Green Emperor Way, and enter the Talos Plaza District where he enjoys a luxury dinner at the fashionable Tiber Septim Hotel. At midnight he returns to the Market District, his shop, and his bed. He wears a pair of burgundy linens with a matching shirt and thick cowhide shoes. He carries around his shop key and a large amount of gold. When you enter his shop for the first time, he gives you the following greeting: "You're in Rindir's Staffs. And I'm Rindir. I sell magical staffs. Imagine that." When asked about the city, he will give you a tip: "My advice is take your time, walk around the Market District, see what's on offer. Don't buy until you've seen it all. Take your time." The citizens of the Imperial City can be heard talking about Rindir and his shop: "Have you ever bought a magic staff at Rindir's?" and "Have you ever shopped at Rindir's?" Some citizens will respond: "Rindir's Staffs is the best place in the city to buy a magical staff. Or is it Rindir's Staves....", "Rindir always keeps a fine selection on hand. It's almost as if he knows my skill level perfectly. ", "A lot of mages swear by Rindir's Staffs. ", and "If you're looking for a staff, that's the place to go." Other citizens will simply comment: "I've never bought one there, but I've heard many mages swear by the place." and "I imagine it must be good, since it's been in business so long." Rindir does not restock the clothing he sells. Esta página foi modificada pela última vez à(s) 03h39min de 15 de julho de 2013.